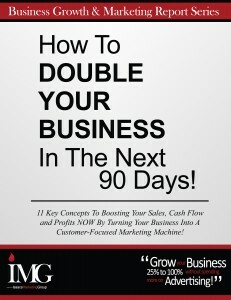 Tags: Double Your Business, Grow your business, IMG Reports, Tags: 90 days. To succeed in business, you need to attract customers. Not just first-time customers, but those who continue to buy from you on a regular basis. It’s “customers” that put you in business in the first place… and allow you keep your enterprise operating. Just the same, a lack of customers will force you out of business — in short order. You can never actually claim to be “in business” until you first have customers. Sure, you can register a company, lease space, buy equipment, develop or acquire a product to sell, and hang out your shingle. But until the first sale… all you have are expenses. Few businesses fail when they have a steady stream of customers willing to spend money in exchange for their product or service. Companies that establish workable systems to consistently attract customers are those most likely to succeed in the long term. Customers are the greatest asset of any business. It’s the customer list that adds significantly to the value of a business.